Sunshine and clouds mixed. High 82F. Winds SE at 5 to 10 mph..
Holden's Olivia Barnes just gets past the tag attempt of Monterey shortstop Mady Green. Gracie Duffy of Holden squares up on a ball during Tuesday's playoff game against Monterey. Holden pitcher Olivia Lackie fires off a pitch against Monterey. Emma Hutchinson is met by Holden coach Linzey Bowers at third base after her home run. Olivia Barnes and Emma Hutchinson celebrate after Barnes scored a run for Holden. Olivia Barnes of Holden slides in under the tag of Monterey catcher Andy Gray at the plate. Lady Rockets Ashley Fogg and Olivia Barnes (foreground) are leading the Lady Rockets into Friday's Class B state semifinal against Zwolle at 4 p.m. in Sulphur. Holden coach Linzey Bowers congratulates Taylor Douglas as she rounds third base after her home run in the first inning. 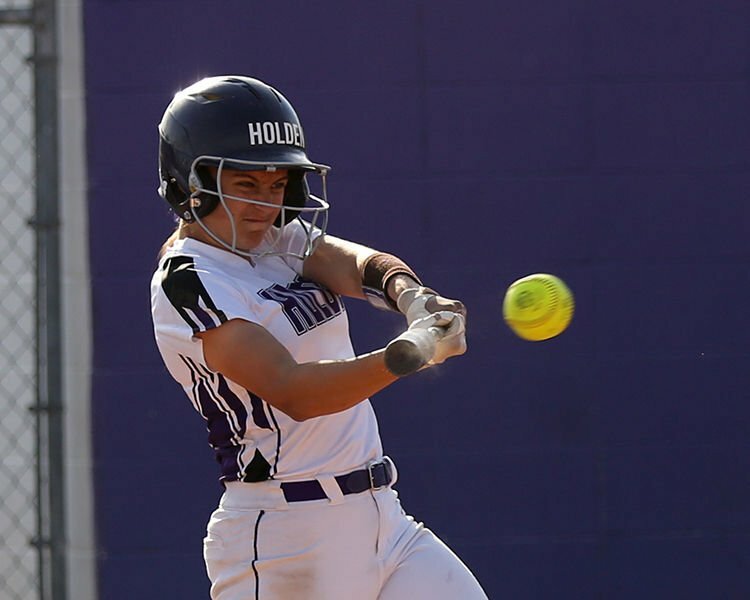 Holden's Taylor Douglas prepares to connect on her home run against Monterey in the first inning. Holden's Ashley Fogg connects early in Tuesday's playoff game against Monterey. HOLDEN – It’s not often Holden’s Olivia Lackie outshines herself in the circle. The junior All-State pitcher was able to swing a dangerous bat as well. Lackie was part of an offensive explosion that more than made up for an early one-run deficit, getting four hits and driving in five runs to lead two-time defending Class B state champion Holden to a 14-1 mercy-rule victory over No. 17 Monterey on Tuesday. The top-seeded Lady Rockets (26-5) host No. 8 Stanley, 4-1 winners over Oak Hill, at 4:30 p.m. Friday in quarterfinal action. Holden collected 18 hits, including five for extra bases – highlighted by home runs from Taylor Douglas and Emma Hutchinson – with every starter recording at least one hit against Monterey’s two pitchers Avery Cupit and Hannan Hitt. 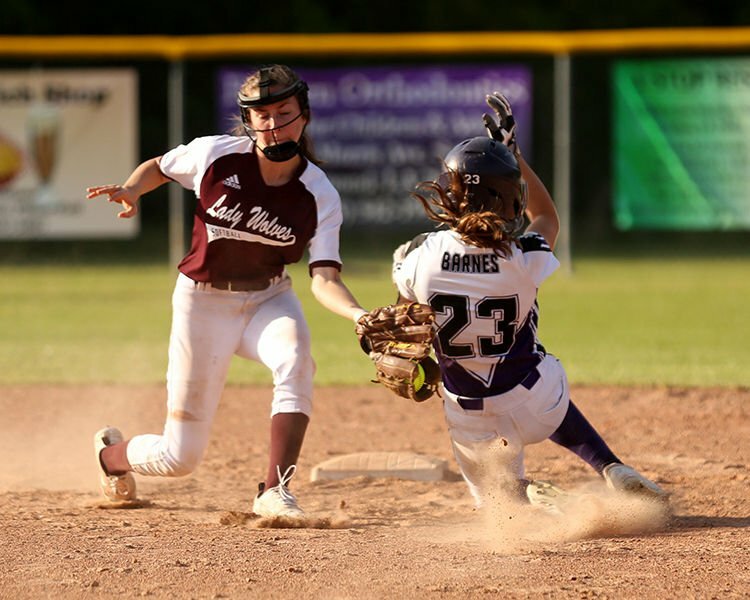 Shortstop Olivia Barnes, who turned in a highlight-reel diving catch on a liner in the second inning, matched Lackie’s 4-for-4 performance and also scored four runs, while Douglas was 3-for-4 with a home run and double and five RBIs. Monterey (8-12) struck first against Holden, putting together back-to-back singles against Lackie to begin the game – the second of which skimmed the top of the glove of a leading Emma Hutchinson at third base and went into left field. Following the second out of the inning, Mady Green singled into right-center field, driving in Harlie Murray, who moved into scoring position by stealing second base. Lackie ended the 24-pitch inning with a strikeout and didn’t look back, retiring Monterey in order in her next two innings of work. She struck out six before Douglas came into to pitch two innings of scoreless relief, getting three strikeouts along the way for nine strikeouts overall for the Lady Rockets' pitching staff. Holden tied the game at 1-1 on Lackie’s base hit to right-center field and took the lead for good when Gracie Duffy (2-4) perfectly timed a change-up, sending it to left field for a 2-1 lead before Cupit could record an out. Douglas highlighted her team’s five-run first inning, hitting a towering 3-run homer on a 1-2 count over the fence in left field. The Lady Rockets batted around in the second, scoring five times on six hits, extending their lead to 10-1, before adding three more in the third and a single run in the fourth. A two-run double from Lackie was the catalyst in the second inning, while Hutchinson’s homer to left-center field on a 1-2 count made it 9-1. Lackie drove in Barnes, who led off the third with a triple, Douglas added a two-run double to left field in the inning, with Lackie capping her day at the plate with a run-scoring single in the fourth after narrowly missing a bid for a home run the pitch before that went foul in left field.